In Swahili Obama means ‘blessed one’ and mothers across Africa were quick to bestow the name on their offspring. ‘Obama babies’ followed in America and across Europe as parents grasped at the hope that the President Elect’s magic could rub off on their children. But one year on and with the President’s dreams being tested by reality, how have some of the babies named after him fared? Peter White explores the hopes and fears of five families and follows their lives as the babies approach their first birthdays. For the babies – including Nancy Otieno’s son, Barack Obama, and Sasha Fisher’s baby, Sanjae Obama – it will be years before they fully comprehend the hopes and aspirations imbued in a name. I’ve just heard the saccharine-filled trailer for the programme – it sounds even worse than the above blurb suggests. Obama’s another guy the BBC will need to work hard for in 2010, and true to form we have the news that The One has been hung in Plains. Georgia. Most be those white supremacists, I guess. Or just a stupid puerile prank unworthy of international news? Or a useful way to ensure that critics of Obama are categorised in the right way? Good to hear the secret service is looking into this, it’s not as if they have anything else to distract them these days…. It’s so sweet to be back and enduring BBC coverage of world affairs. Take the news that Obama just suffered humiliating defeats in the US. Headline stuff, you might think. Nope. On the BBC US portal the big news is that an Italian judge convicts 23 Americans and two Italian secret agents over the CIA kidnap of an Egyptian cleric in 2003. I heard Mark Mardell drooling about Obama and how “cool” he still is even after this bit of a a setback on the PM programme. Utterly pathetic. Did you hear him – he spoke as a fan, not a journalist. The radical leftist agenda pursued by Obama the Cool is going to cause huge alienation in the coming year and it will be informative to watch the BBC do all that it can to try and protect the image of their man in the White House. 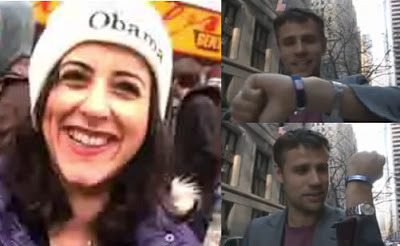 That’s Anita Anand in the Obama hat and Richard Bacon admiring his new Obama wrist band. (Bacon: “Even though I’m technically impartial I’m now allowed to wear one of these”. Love that “technically”.) And before anybody asks, I have no idea whether or not Mr Bacon wears his dainty fashion accessory while vigorously enjoying himself to Obama’s speeches. So, Obama has been awarded the Nobel Peace Price. The BBC coverage here is interesting insofar as even the BBC is forced to fess up that of the thousands of those who have contacted the BBC, 75% have expressed “surprise”. (Though “world leaders” welcome it) I’ll say. My small point is that the BBC makes reference to this award being surprising after his “less than a year in power” period. Erm, bit more than that. The final date for nominations for the Nobel Prize was a mere TWO WEEKS after Obama ascended to high office which means it took just 14 days to carry out “his extraordinary efforts to strengthen international diplomacy and co-operation between peoples”. Hope the BBC make that point clearly since it is pertinent to the quality of the decision. I also enjoy the way the BBC reports the Taliban perspective so ensuring that those of us who think him not worthy are cast into the same rhetorical camp as Islamist killers. B-BBC READER POST OF THE DAY! Comments Off on B-BBC READER POST OF THE DAY! Tip of the hat to DB for this rather excellent contribution! Earlier this week he announced a plan to get 2.5 million Americans back to work. Then he vowed to have his new director of the congressional budget office go through the existing budgets with a scalpel or an axe, depending on what is needed, to cut out any waste. Previous presidents-in-waiting have also made such claims. But such is Mr Obama’s steely-eyed determination and unsmiling sense of purpose that you actually believe him. No Matt – YOU believed him, like the partisan star-struck hack you are. So, how’s it all working out for your boy, the uber-cool super-intelligent bringer of hope and change? Approval ratings plummeting. Unemployment far worse than expected. Vast amounts of pork barrel spending hurried through unchecked. Deficit projections now up to nine TRILLION dollars. Well over half of senior policymaking positions still unfilled. And total chaos over health care reform, not least because President Clever and his mega-bright administration were wrong-footed by none other than Sarah Palin. That last one must really hurt, Matt. Obama’s “cash for clunkers” scheme has just finished and the BBC ran this item on it this morning, suggesting that it has been a hugely popular success. The meme is that the stimulus is working. In a four and a half minute item, the BBC kindly provided 30 seconds to the view that this has been far from economically effective and may cause more harm than good. The bias is clear – cash for clunkers is just swell and Obama is on the right path. Did you listen to this discussion on Today this morning concerning the issue of when global powers should intervene abroad with military force? Obama addressed this issue in his speech in Cairo and then this is compared to a speech given by Tony Blair in Chicago in 1999. In essence, the BBC approves of the “pragmatism” that pervades Obama’s triangulating and dhimmifed speech and it’s one more opportrunuty to attack UK support for the Iraq war. The BBC narrative is that military intervention is NEVER a good idea – unless it would be against Israel, of course. Both contributors are drooling Obama worshippers and thus we have an item which seamlessly avoids any criticism of Obama. It’s all about “reaching out” to Islam and so Obama and the BBC have a shared agenda in this regard. A candidate for gratuitous and unnecessary pr-Obama report of the year month week perhaps? I spotted this earlier, as I know others have, but this is the first chance I had to blog it. Have YOU seen the “report card” that the BBC thoughtfully commissioned on Obama’s first 100 days from Prof Iwan Morgan? It’s riddled from start to finish with extreme left-wing bias and no effort has been made by the BBC to allow any commentator critical of The One to have their say on this report card. In truth, is it not fair to say that Morgan is simply expressing “the narrative” and is given carte blanche to reinforce this? OBAMA – THE FIRST GLORIOUS 100 DAYS. Comments Off on OBAMA – THE FIRST GLORIOUS 100 DAYS. Anyone catch the tributes BBC TV was paying to the first 100 days of the era of Obama the 1st this morning? Gushing, one-sided and the only watch-out note struck was that perhaps he had not gone far enough yet to “roll back the years of the Bush Presidency”. It’s not news, it’s propaganda.